Although Milly’s colorful Fall collection won’t be hitting the East Hampton store for a few more weeks, we couldn’t wait to get the 411 from creative director Michelle Smith. We hit the Big Gay Ice Cream shop in the heart of New York City’s Greenwich Village neighborhood to get the (ice cream) scoop. What brings us to the Big Gay Ice Cream shop? Well, it’s Pride Month! 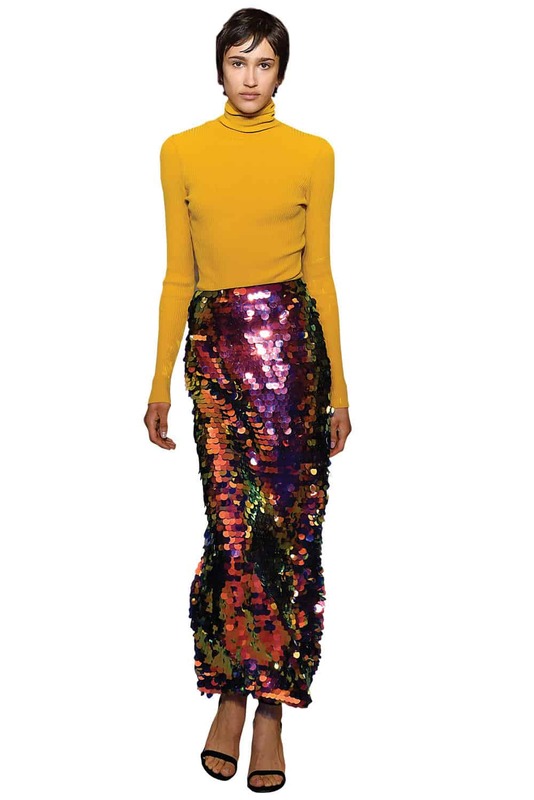 I’m not coming out, but I am a big, ardent supporter of equality and LGBTQ rights, and my upcoming Fall collection was all about color and using the rainbow as a metaphor. Each model was dressed in individual, monochromatic colors—red, orange, yellow, green, purple, gold, silver, black—and the point there was harnessing the power of an individual color and acknowledging that our individuality is our greatest strength. When we come together and we collaborate, it becomes a beautiful rainbow, and isn’t that the most spectacular thing? What inspired this Milly moment? During the Obama administration, I didn’t feel that human rights and equality were under threat, but now, under the Trump administration, I feel like we are under a threat, and it’s a really important time to speak out about what we believe in. I feel fortunate to be able to use my brand as a louder platform to spread the message of equality and tolerance and inclusivity. I really want everyone to feel welcome in the house of Milly. It is good luck, supposedly. I’m dying, though. Can you believe this? This dress is destroyed. I’m going to barf. Getting back to the important stuff: What’s the collection called? What’s the style of the collection? I used a lot of cool, very modern fabrics. You’ll see a lot of transparency and new pearlescent finishes in a lot of the fabrics. I love mixing textures. The whole show is vegan! I want a woman to feel amazing, confident, and empowered when she wears my clothes. I’m always thinking about that when I’m designing, and I’m always thinking about that when I try it on. You had a huge professional honor this year. Tell us all! 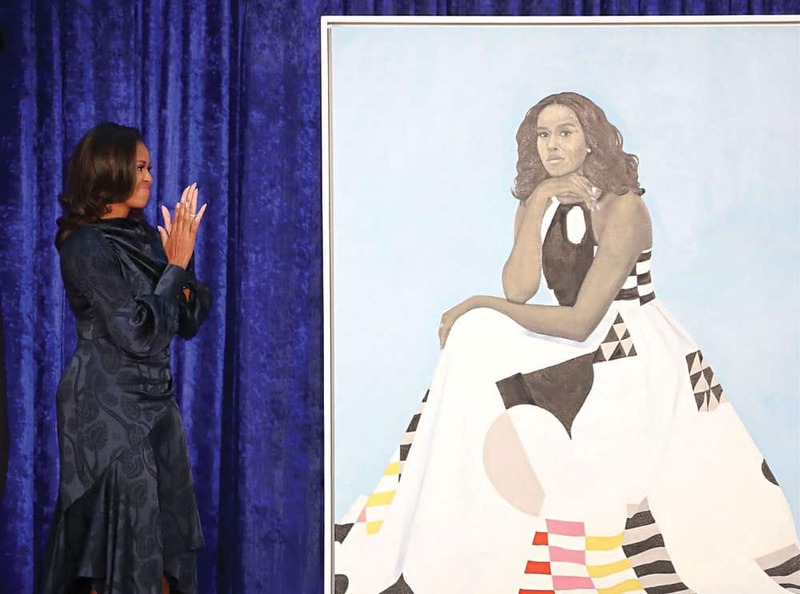 Michelle Obama wore one of my designs in her official portrait by Amy Sherald that hangs at the Smithsonian’s National Gallery in Washington, D.C. It was a big, exciting, secret project of mine in 2017, and I am so honored and humbled to be a small part of the Obama legacy in that way. It’s the ultimate honor for a designer—the ultimate honor for anyone! I was asked to create a dress about a year before the portrait came out, and four or six months before it was released, it was confirmed to me that she was indeed wearing the dress. I was so excited, and then real life caught up with me, and I put it in the back of my mind. I was totally caught by surprise when my publicist called to tell me the Obama portrait was about to be unveiled and they wanted me to give a statement. Was Michelle a Milly client? She started wearing Milly during the first term, and to have a woman like that wearing my clothes is the ultimate honor. I’ve met her twice. I’m a member of the CFDA, and some of us were invited to the White House for a reception, and I met her as part of a formal receiving line. I was so nervous, and she broke the ice and said, “I love your dress!” I’ll never forget that moment. About two or three years later, I was invited to the White House for their final party the day before the Obamas moved out, and it was a very relaxed environment. People were dressed to the nines, and no cell phones were allowed. Everyone really relaxed and let loose, and it was a surreal, beautiful experience. It said a lot about how special the Obamas are. I think we left at four in the morning! Perhaps we’ll run into Michelle at your East Hampton store this summer? Is she coming to the Hamptons? I just got really excited! What’s new in the store this year? I’m really excited about my new Milly cabana swimwear collection. It’s a big, big collection—lots of great shapes for all body types. East Hampton is the perfect place to showcase something like that, and I try to curate the vibe of our store in the Hamptons to be more beachy. We have everything a woman in the Hamptons needs — beachwear, going-out clothes, hanging-by-the-pool looks, and even new T-shirts and hoodies with my signature sayings, like Fries Before Guys, Influencer, and Equality. How often do you pop in to the store? During the summer, every weekend. I love to hear what the customers are saying. I like to strike up a conversation, but I try not to harass them. I’m the kind of person who likes to be left alone when I’m shopping. You’ve also dipped your toes into a major new project. I’m really excited to be designing the ballet costumes for the Ashley Bouder Project, an all-female dance effort premiering at the Joyce Theater in New York City from July 2–5. Ashley is a principal dancer with the New York City Ballet, and she has her own dance company as well. Never, so I’m really excited! I love ballet — I danced as a kid, and it has never left me. Is July a stressful month because of the next collection looming? I’m the kind of girl who loves that last-minute pressure. The adrenaline rush gets my creative juices flowing, so in July, you’ll probably see me chilling on the beach — and I shouldn’t be. In August, though, I’ll be back in the city, working hard. By the way—how was the ice cream? Divine. Big, gay, and amazing.